Chelsea boss Maurizo Sarri known to be a chronic cigarette smoker makes plans to quit his 80-per-day cigarette habit while he manages the Blues to challenge in the Premiership League, but reports about his quitting plans has a clause of resuming the same habit after some seasons. 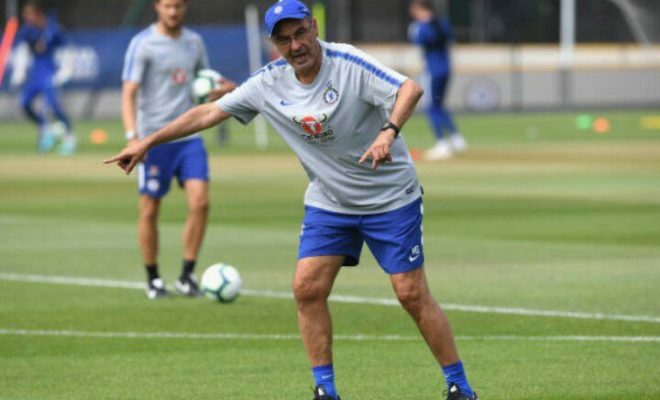 Sarri’s addiction to nicotine has seen him captured in different shots with a burning stick of cigarette while on side-lines on his duty posts during his time in Italy, but he can’t afford to keep the same habit of smoking while he is coaching Chelsea. Reports have it that Sarri has been coping by chewing on unlit cigarettes while fiddling with his cigar lighter and the holder while on the English side playing pitch, he has to comply with the strict ban on smoking which has been enforced since 2007 in all English stadiums. Following their first Premier League game, Chelsea have enjoyed a smooth start with a 3-2 victory at Stamford Bridge against Arsenal last weekend under Sarri, speaking after the match, when Sarri was asked how he felt without smoking, if the pressure of the match gave him the urge for a smoke, he affirmed he was quitting the habit as a whole but will resume after some time, and that he need the game more than he needed a cigarette. However, there are option of nicotine patch which he can reply on if the urge and cravings are unbearable.